I never knew I was a warm weather beach kind of girl until we moved to Texas. We lived by the gorgeous Gulf of Mexico and it was warm all year round. I missed skiing a little bit, but not enough to move back to the cold. Some how we ended up back in the cold anyway, it is supposed to snow tonight and I am mourning the loss of the my summer sunshine. I like to hibernate with a cup of hot chocolate and a warm blanket until spring time, with soup on the menu almost every night. This particular soup is a family favorite. It is easy to make and so yummy. 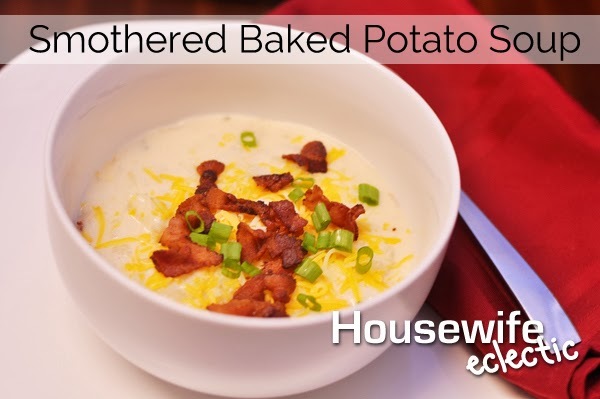 It tastes like a smothered baked potato, in soup form. Quarter the potatoes and boil in water until tender. Fry the bacon in small pieces until very crispy. Saute the onion in olive oil until translucent. Whisk the flour into 1/2 cup of the milk. Add the chicken broth to the onions and then add all the milk, including the milk with flour to the broth. Bring the soup to a boil, stirring frequently until heated through. Remove from the stove, add the sour cream, seasonings and potatoes. Top with cheese, onions and crumbled bacon before serving. If you need me, I will be hiding under a pile of blankets with a bowl of soup, waiting for spring. What are your favorite things about winter? This looks delicious and it would be easy to make gluten free. Pinned! I love a good warm soup! Thanks for the recipe! Looks so good. I love that it uses red potatoes! It's snowing like crazy today and this soup looks like the perfect dinner for tonight! Looks amazing! I am really into soups this year, and I can't wait to try this! Yum! Potato Soup is one of our favorite meals. We'll try this recipe next time I make it. Looks delicious.